Crocheted Baby Sweater free pattern by Beth Koskie in 2004, although this pattern is now many years old it still remains a classic and popular free baby crochet pattern loved by crocheters everywhere. An easy and quick crochet project to make for new babies from 0 to 3 months old. Comprising of mainly the double crochet (DC) stitch, you will have this lovely and warm little cardigan crocheted in no time. 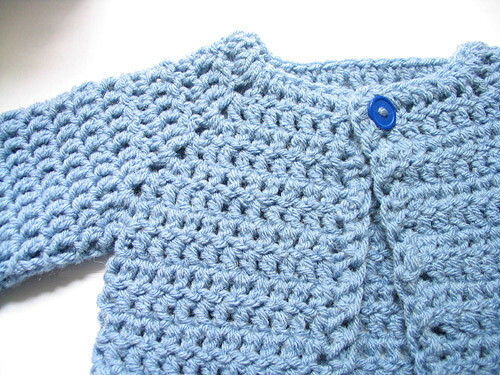 Make this free baby cardigan crochet pattern for baby showers and to gift to those who jut had a baby. 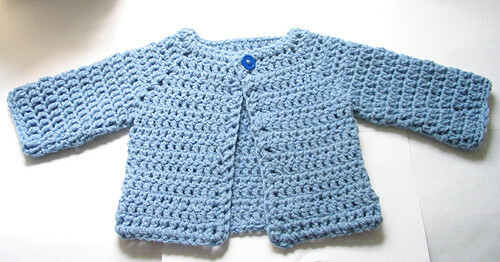 There is nothing nicer than receiving a hand made personalized gift like this crochet baby sweater/cardigan. This baby sweater/cardigan comes with long sleeves and closes with the use of just one button in the collar of the garment. So get out your hook and let’s begin!